Our stop in Stanley was the first and only ‘city-esque’ landing for our entire 20 day Antarctic expedition voyage. 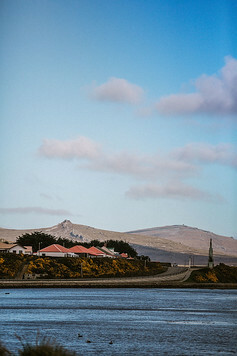 We were just about a week in our sailing with Poseidon Expeditions and were looking forward to exploring the capital of the Falkland Islands. Despite being nearly 8,000 miles from the United Kingdom, Stanley felt a lot like a mini Britain! 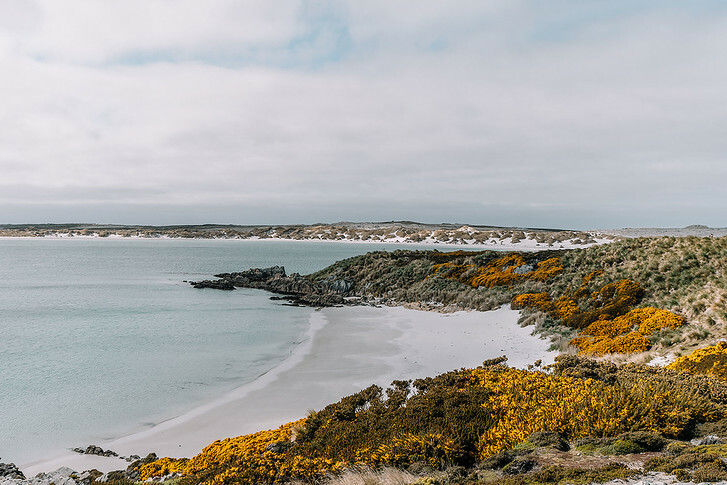 With red phone booths, iconic Land Rovers and lots of pubs specializing in fish and chips, Stanley felt like the complete opposite of the wild, remote landscapes throughout the rest of the Falkland Islands. Today we’re sharing a quick travel guide to Stanley – what to see, do and eat with just a day in this quaint British harbor town. Stanley is a small place, the kind of town where you imagine everyone knows everyone. Internally self-governed but classified as a British overseas territory, the island feels quaint and scrappy. It has its own currency, the Falkland Island pound, but it’s pegged one to one with the British pound. We disembark the ship, hopping on a local bus into town. Stanley is rich in history, and we take the opportunity to stock up on souvenirs, internet cards and last-minute toiletries before our expedition into the remote unknown of the Antarctic. As we drive in, we see quaint homes painted in bright colors, topped off with iron roofs. The friendly driver mentions that the local stone was too difficult to work with, so timber and iron have been imported from the UK to craft local homes. Built on a visible slope, the pretty blue harbor is never too far from view. 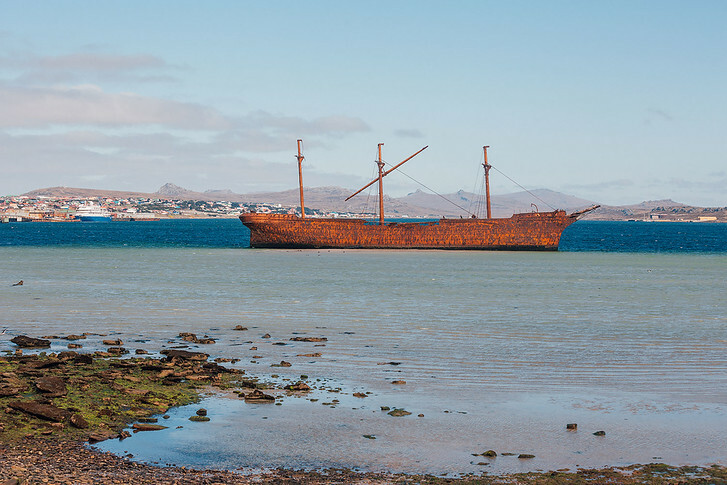 But as we disembark and explore, we notice subtle reminders all over town of the Falklands’ past: both its pivotal outpost during whaling times as well as the most recent Falklands War. 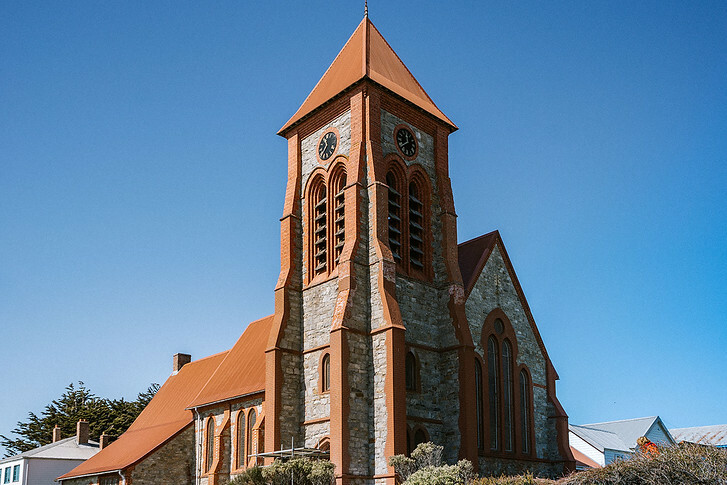 Located on the East Island, Stanley is the major metropolis of the Falkland Islands. Over 75% of the population live in this quaint harbor town. Although we spent just a day in the capital, it was more than enough time to soak in Stanley’s British flavor. We mostly walked around on foot to take in the sights, stopping into souvenir stores and museums to learn more about the history of the Falklands. Here are 6 fun things to do in Stanley! Christ Church Cathedral is the southernmost Anglican cathedral in the world. 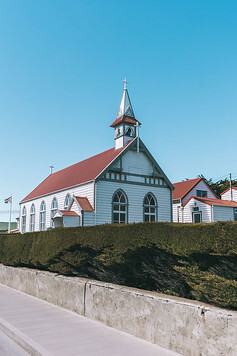 Consecrated in 1892, its parish includes all of the British territories in the Antarctic region: so not just the Falkland Islands, but also South Georgia, the South Shetland Islands and the British Antarctic Territory. This pretty stone church is just near the end of the main road. It’s worth walking around, as right near the entrance are two huge whale bones, planted into the ground in 1933 to commemorate a hundred years of British rule. It’s quite humbling standing underneath the bones, as they’re thick and massive. You might have to wait your turn – almost everyone wants a photo with these! Even if you’re not a museum person, the Historic Dockyard is a must visit. 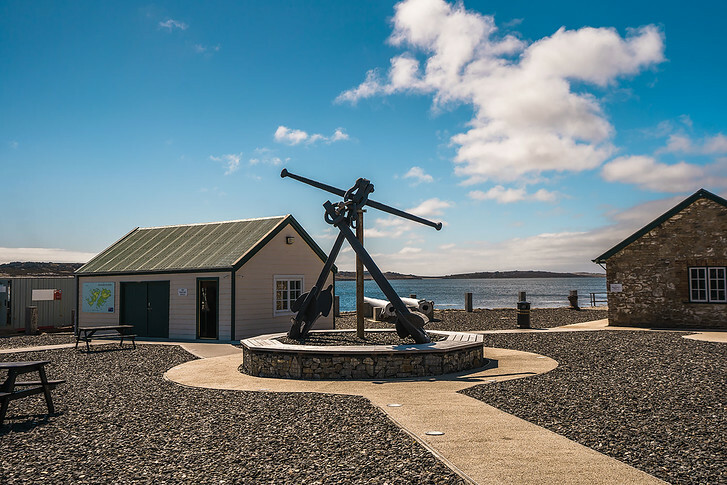 The main visitors center is dedicated to maritime history and explores the unique birds and mammals native to the Falklands region. Special exhibits on the first floor are dedicated to the Falklands War and provided the most comprehensive understanding of the 1982 conflict. Keep wandering and you’ll walk into rooms explaining the importance of Antarctica, the early expeditions and what Antarctica is like today. 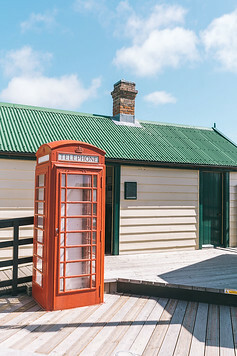 Outside the main museum complex are a couple historic recreations of buildings from Stanley’s founding: a telephone exchange, blacksmith workshop and store. There are many monuments to the Islands naval heritage and Falklands War throughout town. First person accounts of the war can be read at the Dockyard museum. Meanwhile, military equipment and bomb craters litter the landscape, and some areas of the countryside are still dotted with landmines. Local guides can lead you on a tour of battlefields, pointing out some of the key battle sites from the 1982 Falklands War. Stanley itself was occupied by Argentine troops for roughly 10 weeks during the war. They renamed the town Puerto Argentino and in some buildings, we could see signs proudly declaring British sovereignty and posters asking Argentina to respect the outcome. You can also visit the 1982 Liberation Memorial, a tribute to those who lost their lives during the conflict. Gypsy Cove is roughly a 20 minute drive from Stanley. This dramatic, beautiful bay is quite picturesque and a must visit if you enjoy landscapes. The area is well-marked with footpaths which meander around Yorke Bay, with scenic views of the crystal turquoise waters below. If you’re lucky, you might spot some Magellanic penguins burrowed in the tussock grass. They’re pretty shy, so we saw just 1 or 2 on our visit. Further down on the beach were lots of other small birds and we even spotted a rock cormorant and black crowned night heron! If you do visit, make sure to stay on the path! During the Falklands War, the Argentines planted many landmines in the area outside the capital. On the drive (or walk) back from Gypsy Cove, you’ll pass a haunting ghost ship beached off the coast. During high tide, most of the ship is submerged but in low tide, you can see the rusty skeleton clearly. The Lady Elizabeth was sailing through the Falklands when she struck a rock off Volunteer Point. Although she managed to make her way to Port Stanley for repairs, the damage was considered too great and the iron barque was condemned in 1912. It remains mostly intact, partially beached in the cove. Stanley is quite compact and mainly consists of the Government House, Town Hall, museum and a scattering of churches, restaurants and hotels. Everywhere you turn, you’ll find British architecture, accents and pubs. The current Town Hall was built in 1950 to replace the earlier one destroyed by a fire in 1944. Here you can find the Post Office, Court offices and main hall. Don’t forget to mail a postcard! The city is also great for shopping as the Falklands are well-known for leather goods. You can find local boutiques, kitschy penguin hats and wool goods at any of the harbor side cafes. The food is also quite good! After a day of sightseeing, there’s no better way to relax than to stop into one of the local pubs for a hearty meal and pint. Have you been to other British overseas territories? What were they like?